"Lyrical, shrewd, and daring novelist Nahai...writes with acute emotional and nearly anthropological perception, laser-wit, and deep compassion....With touches of magic realism, extraordinary characters, and a spiraling, multigenerational plot involving fraud, a murder mystery, epic suffering, heroic generosity, women's struggle for freedom, and the clash between East and West, Nahai's mythic, tragic, often beautiful immigrant family saga illuminates timeless questions of prejudice, trauma, inheritance, loyalty, and love." "A riveting tale....Readers will be well rewarded." "A wide-ranging, page-turning, magical realist, multigenerational family saga and Iranian-Jewish-American immigration tale enveloped in a murder mystery...it both entertains and instructs, and its differing genres seem more complimentary than conflicting." "Nahai has crafted an engaging combination of family saga and murder mystery, placed it in the framework of a relatively unknown subculture, and people it with fascinating characters. Flavored with both elements of magical realism and down-to-earth observations, The Luminous Heart of Jonah S. brings a little-known Los Angeles community to vivid life." "What results is a novel that feels more universal than anything, and an engrossing, expansive epic that charts not only thousands years of Iranian Jewish life, but the brutality of one family's survival amidst revolution and cultural upheaval." "A bold, brave novel...as surprising as it is satisfying....Captivating." "One of the many pleasures of this sprawling, multigenerational story is the way it transcends the specifics of the Iranian diaspora with insights that could apply to anyone." "One of Nahai's gifts is her astute observation of this community, her own, which she describes with unsparing precision." "The Luminous Heart of Jonah S. is a masterpiece that is simultaneously poetic in its unfurling, trans-generational plot, and brutally to the point in the style of a hard-boiled crime novel...This is a book you should not miss." "Nahai's eye for detail, whether it's succinctly summing up a funeral or providing a description of a Tehran summer, always seems to be spot on." "An intriguing murder-mystery journey anchored within the Iranian-Jewish community of Los Angeles. Vivid and raw...Nahai masterfully introduces us to the mythical and mundane layers that make up Iranian-American identity." "This is irresistible storytelling...Nahai uses her estimable gifts to offer a nuanced, sometimes satirical portrait of the tight-knit Iranian-Jewish exile community in Los Angeles...It's a fascinating read." From Tehran to Los Angeles, The Luminous Heart of Jonah S. is a sweeping saga that tells the story of the Soleymans, an Iranian Jewish family tormented for decades by Raphael's Son, a crafty and unscrupulous financier who has futilely claimed to be an heir to the family's fortune. Forty years later in contemporary Los Angeles, Raphael's Son has nearly achieved his goal--until he suddenly disappears, presumed by many to have been murdered. The possible suspects are legion: his long-suffering wife; numerous members of the Soleyman clan exacting revenge; the scores of investors he bankrupted in a Ponzi scheme; or perhaps even his disgruntled bookkeeper and longtime confidant. Gina B. Nahai is a best-selling author, columnist, and full-time lecturer at USC's Master of Professional Writing Program. Her novels have been translated into eighteen languages, and have been selected as "Best Books of the Year" by the Los Angeles Times and the Chicago Tribune. She has also been a finalist for the Orange Prize, the International IMPAC Dublin Literary Award, and the Harold U. Ribalow Prize, and has won the Los Angeles Arts Council Award, the Persian Heritage Foundation's Award, the Simon Rockower Award, and the Phi Kappa Phi Award. Her writing has appeared in the Los Angeles Times, Chicago Tribune, San Francisco Chronicle, Los Angeles magazine, Publishers Weekly, and the Huffington Post, among others. She writes a monthly column for the Jewish Journal of Greater Los Angeles, and is a three-time finalist for an LA Press Club Award. Nahai holds a BA and a Masters degree in International Relations from UCLA, and a Master of Professional Writing from USC. She, s a former consultant for the Rand Corporation, and a frequent lecturer on the politics of pre- and postrevolutionary Iran. 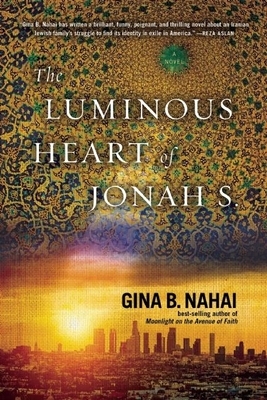 The Luminous Heart of Jonah S. is her latest novel.